NLM’s History of Medicine Division is offering special tours for the 2016 NIH Research Festival on September 14-16, from 9 to 10 am, in Building 38 across the street from the Natcher Conference Center. We look forward to sharing highlights of our historical collections and resources. Our current display Confronting Violence, Improving Women’s Lives tells the story of nurse activists who changed the way the medical profession responded to patients who had been battered. At a time when the greater medical community largely dismissed domestic violence as a significant health issue, these activists identified victims of battering, responded to their needs, and worked towards prevention. The display includes buttons, posters, and photographs from the first generation of nurse activists and objects from today’s activists and community organizations. Confronting Violence, Improving Women’s Lives is open until October 14, 2016. Detail from the special display Confronting Violence, Improving Women’s Lives. We’ll share original classic books by Andreas Vesalius, one of the most celebrated physicians of the early modern era; William Harvey, the first individual to describe the circulation of blood in the body; Edward Jenner, the English physician and scientist who pioneered the smallpox vaccine; and Charles Darwin, whose influential work On the Origin of Species the NLM holds in multiple first editions published in a variety of languages. Woodcut portrait of Andreas Vesalius from his De Humani Corporis Fabrica Libri Septem, 1543. Title page of the first edition of Charles Darwin’s On the Origin of Species in Russian. “Adam and Eve” from De Humani Corporis Fabrica Librorum Epitome, 1543. Title page of the first American edition of Charles Darwin’s On the Origin of Species. Title page of the first edition of Charles Darwin’s On the Origin of Species in German. Title page of the first edition of Charles Darwin’s On the Origin of Species in French. We’ll discuss some of the earliest manuscripts in our collection, and we’ll offer visitors an opportunity to see the Nobel Prize medal awarded to the Marshall Nirenberg for genomic research conducted at NIH. 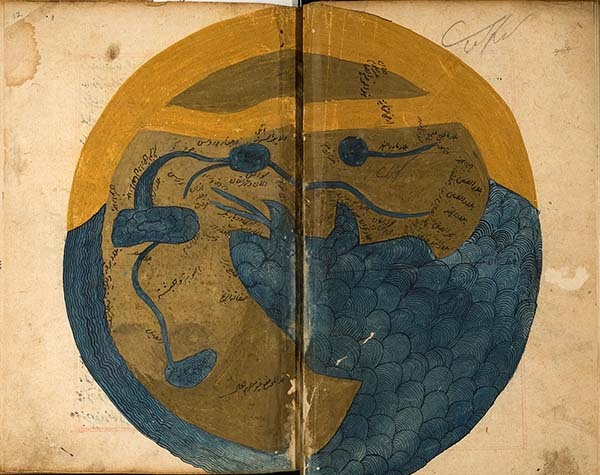 Among the NLM’s rich collection of Arabic, Persian, and Turkish manuscripts relating to health and medicine is Kitab-i ‘Aja’ib al-Makhluqat wa Ghara’ib al-Mawjudat (in English, Marvels of Creatures and Miracles of Things Existing or sometimes, The Wonders of Creation), written by Abu Yahya Zakariya ibn Muhammad ibn Mahmud al-Qazwini (ca. 1202–1283 CE). Participants will learn how these materials, alongside NLM’s rich digital collections, can support research. Each day in cooperation with our colleagues across the NLM, the History of Medicine Division collects, preserves, makes available, and interprets for diverse audiences one of the world’s largest and richest collections of historical material related to human health and disease. We proudly undertake our work as part of the NLM’s broader role in translating biomedical research into practice and being a leader in information innovation. In fact, like the institution of which we are part, we embrace the future as stewards of the past. NIH festivalgoers can attend one of the 9am tours September 14-16. But if you aren’t attending the festival, you can still visit us Monday through Friday from 8:30 to 5:00 (except federal holidays). Daily one-hour tours at 1:30 feature an overview of NLM programs and a walking tour that includes the History of Medicine Division. These tours begin in the NLM Visitor Center, off the first-floor lobby of NLM’s Lister Hill Center, Building 38A. Walk-ins are welcome, but we request reservations for groups larger than five. You may also call 301-827-6479 to discuss group tours. Of course, anyone anytime can explore the richness of the NLM’s collections and resources online. The NLM’s main website is your gateway. September 7, 2016 in Events.